I have been playing golf for 64 years. I changed clubs every few years buying the latest in technology. My brand loyalty shifted several times, but I’ve stayed with mostly traditional equipment. About 20 years ago I was fitted for irons at PING in Phoenix. Since that time (my only fitting), I have been playing PING irons, 2° upright. Each new set of golf clubs took a little getting used to. I probably had to make a few swing adjustments to play effectively with my new equipment. One time last year I hit a few balls into a Trackman screen, but I did not understand the blizzard of information puked out of a computer. “Just more hocus-pocus,” I thought. 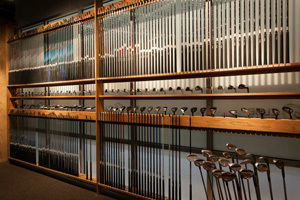 A few weeks ago the Editor of Tee Times asked me to visit the new Club Champion store and go through the driver fitting process so I could write an informed story about the company and the process. I did a little research about Club Champion before my fitting and learned that the company is the newest and fastest growing club fitter and retailer in the USA. Their new Twin Cities location, northeast corner across from Southdale in Edina, is the company’s 20th fitting and retail outlet. Every one of the Club Champion’s employees has spent a month at the home office in Chicago where they go through the exact same training. Each of these highly trained professional has been trained in the very latest Trackman analytical technics. They work with each golfer creating a perfect match of their swing with their equipment. From its inventory of more than 35,000 hittable head, shaft and grip combinations, Club Champion finds the perfect clubs for every golfer who wants to play better. As I walked into the brand new studio with my clubs on my shoulder, I said hello to my old friend George Smith, PGA Professional and Master Fitter and Builder for Club Champion. The first thing I noticed was an entire wall covered with golf shafts, in a rainbow of color, neatly placed in vertical rows, like pool cues. After a little chit-chat, we got down to business. “We are going to treat you just like any golfer that we had never met,” George said as he handed me a clipboard with a form attached. “Are you recording each of my shots?” I asked. “That last one was really not very solid,” George told me to hit a few more. “I am one of those people who doesn’t want to know how to make a watch. I just want to know what time it is,” I said with a smile. For the next hour, I hit drivers with heads from four manufacturers, and a variety of shafts. To make it simple we compared all the averages and found the driver that delivered the optimum Trackman results. Now I am waiting for my driver being built in Chicago (about 10 days).